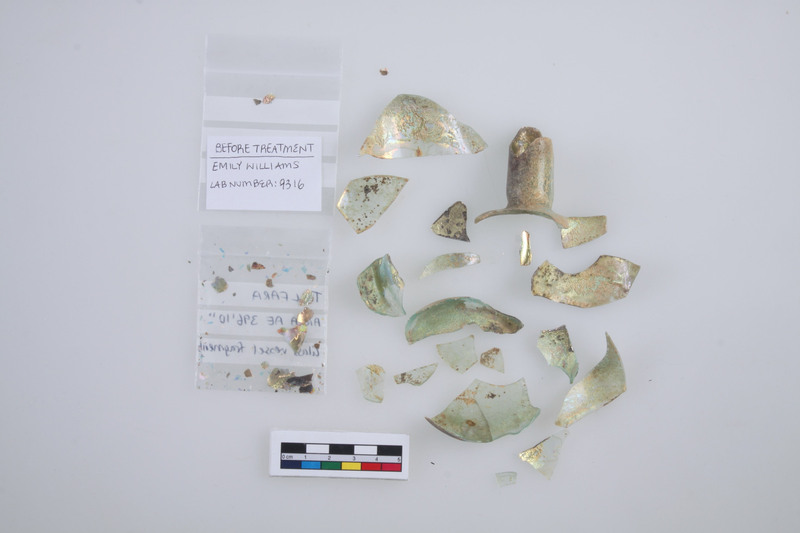 When I first came across the box full of archaeological glass fragments in the conservation lab, it raised a strong sense of curiosity and concern – I did not want the box of bits to go back to the collections store in the same condition, and without knowing what this golden iridescent glass used to be. 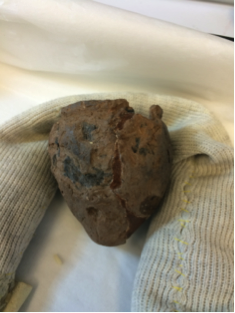 The box contained 19 fragments, too few to make up a whole vessel, so early on, I had to abandon any idea of being able to reconstruct a complete object. After many hours of research, and what felt like the longest, most complicated puzzle I had ever done, I was however able to piece enough fragments together to infer the shape of a bottle. 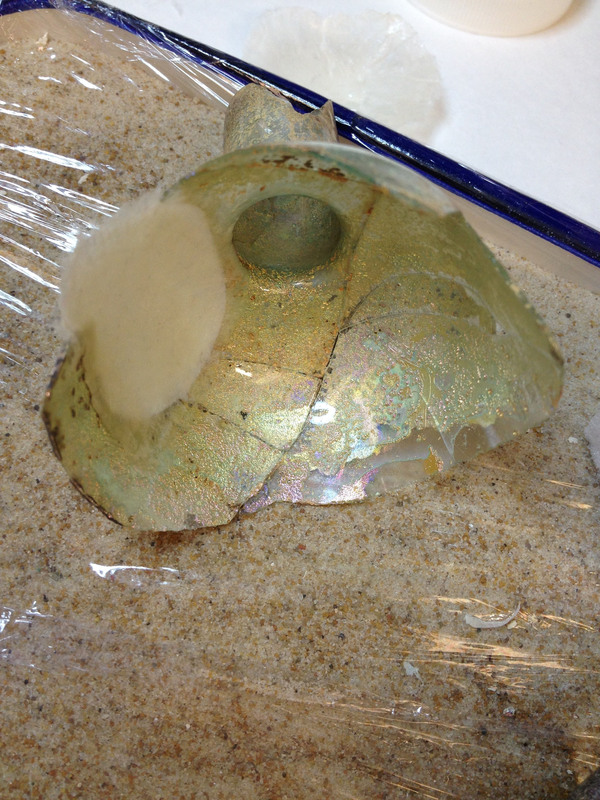 Once I had identified that the fragments formed a bottle, I attempted to reconstruct it. 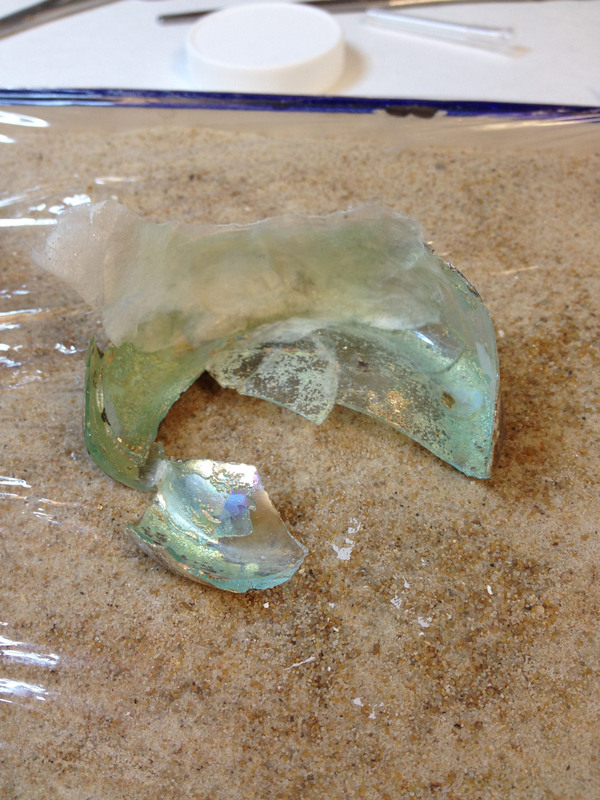 The glass was however too fragile to handle without the surface layers becoming detached. Before I could do anything else, I needed to consolidate the surface. This was done using very low percentage of Paraloid B 72 in acetone. 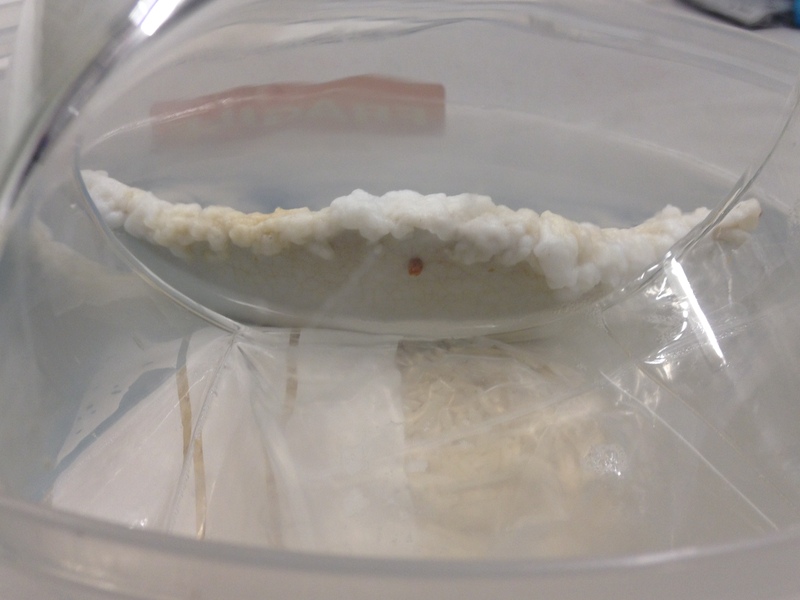 I carefully applied this solution so that the polymer went under the delaminating flakes in order to reattach them to the underlying glass. 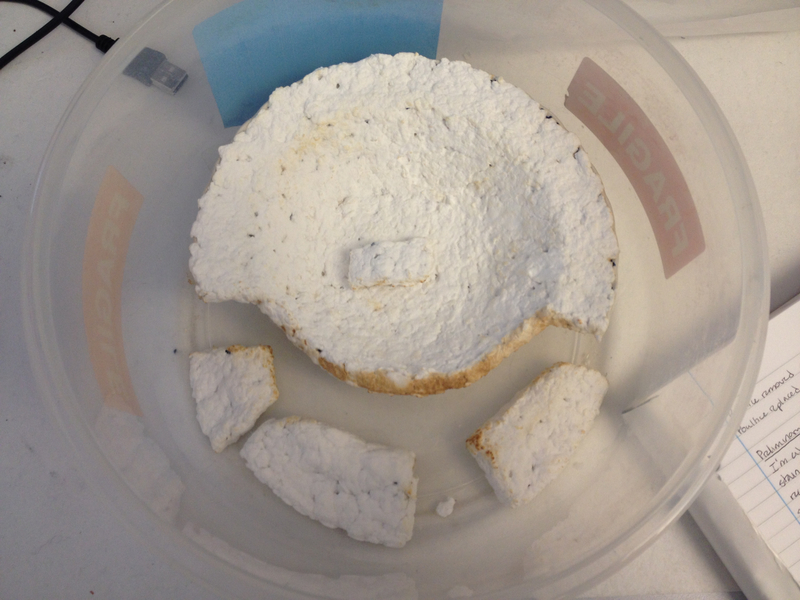 After I consolidated the surface, I put the fragments together with a more concentrated solution of Paraloid B 72. 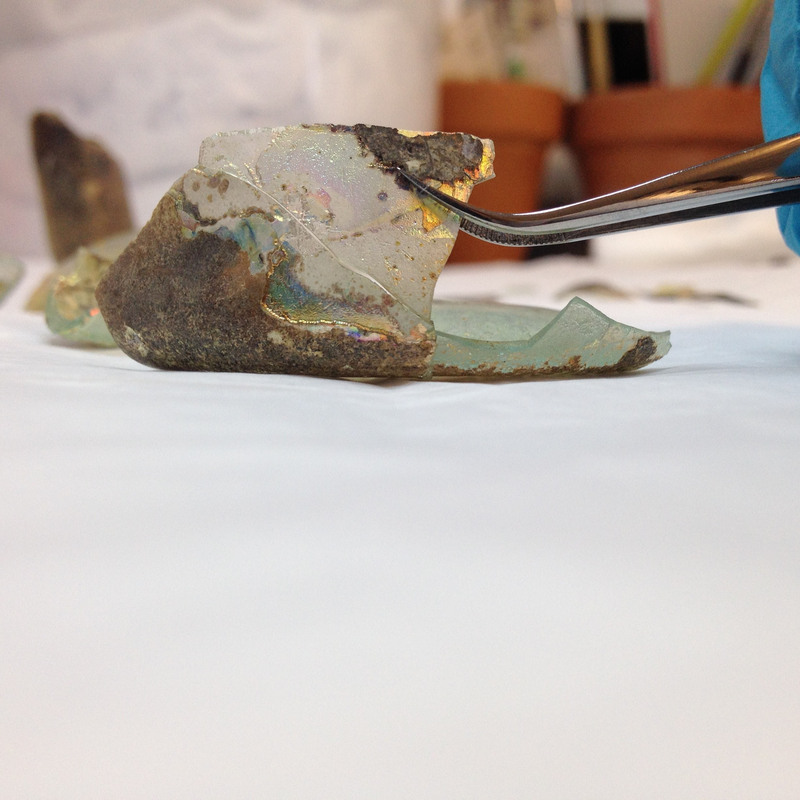 Stronger epoxy adhesives are often used to reconstruct glass objects in collections (like Hxtal NYL-1), but was not used with this archaeological object as the treatment would not have been so easily reversible. 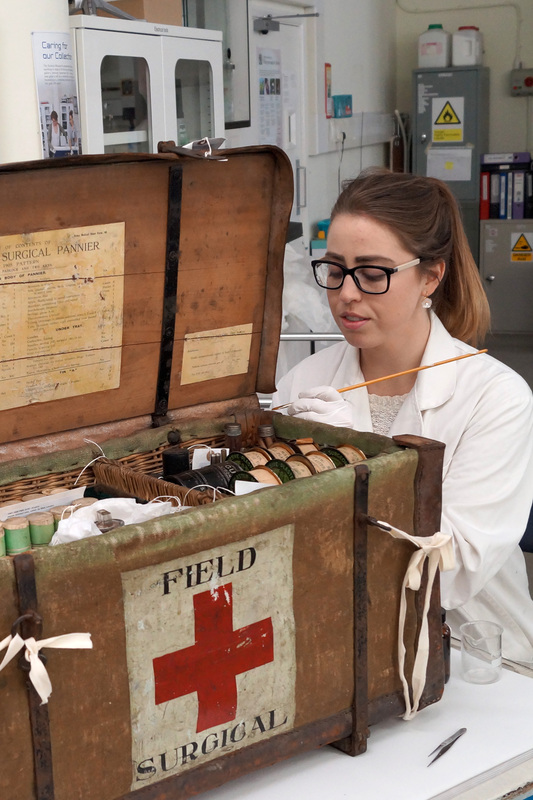 The potential for conservators in the future to retreat our conserved objects is always considered when we make decisions about our treatments now. I then used watercolour paints to colour Japanese tissue a very pale blue/green and sandy yellow in order to match the colour of the glass underneath the layers of corrosion. The tissues were shaped by hand, cut to size, and then attached as a support to the reassembled glass fragments. For the upper section of the bottle, I experimented using a light bulb as a base to create my rounded fill. Shaping Japanese tissue so that it remains curved can be quite tricky. 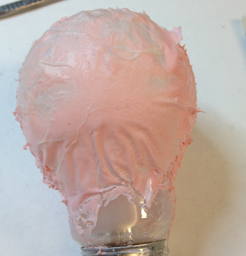 My lab partner Robert suggested I coat the light bulb in a thin layer of silicone to create a barrier between the two, this allowed me to remove the tissue from the light bulb surface once it had dried. I used T40 Silicone Rubber from Tiranti, which is a two part thixotropic mixture with a curing time of approximately 30 minutes. 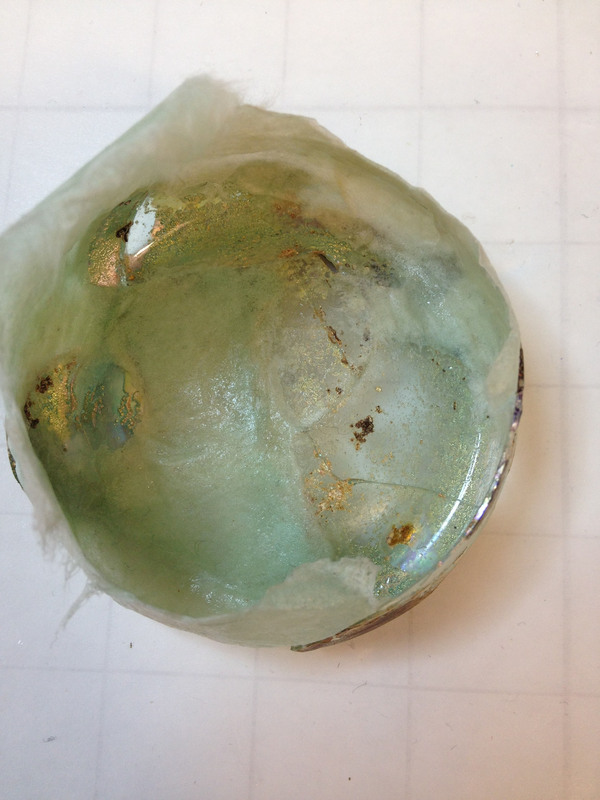 One complicated aspect of the reconstruction was having to figure out how to reconstruct a closed vessel when the only opening was through the very small and narrow neck of the bottle. Once I had all my tissue supports in place, I inserted a bent wooden stick with a flattened silicone tip so I could reactivate the adhesive with acetone and use the silicone tip to press the tissue onto the glass from inside the bottle. Finally, the glass bottle reconstruction is now complete! 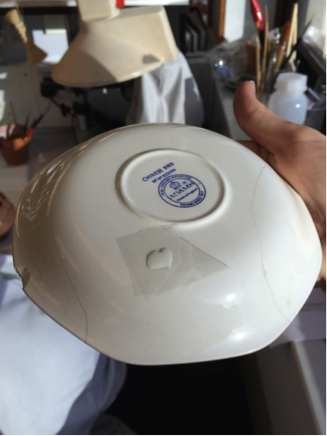 The object will be returned to the UCL Institute of Archaeology’s Palestine-Petrie Collection, and is now readily available for teaching and research. One of the interesting things about this object is that it was excavated by a rather famous early archaeologist, Sir William Matthew Flinders Petrie. 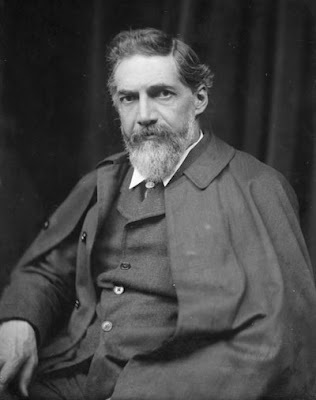 Petrie is famous in archaeological circles as a pioneer of modern archaeology, implementing methodical techniques and caring about the small details. 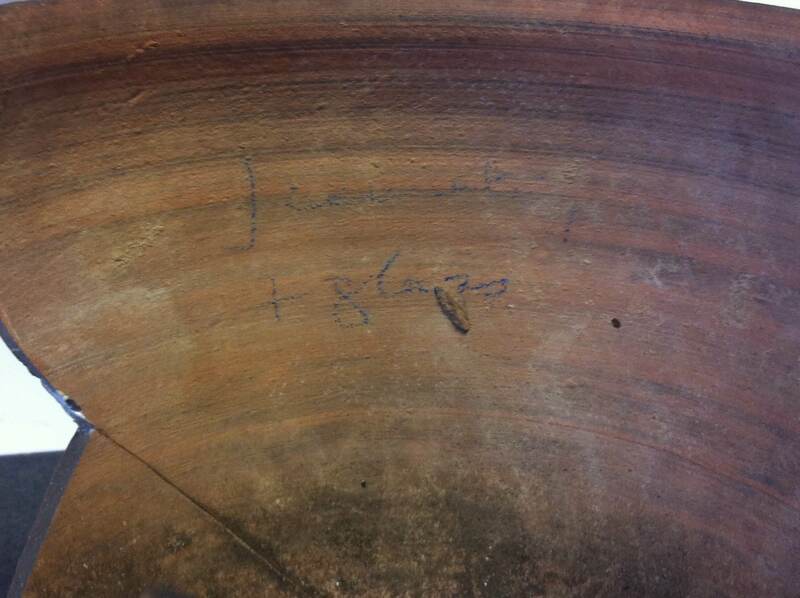 Petrie’s legacy was visible right on the inner wall of one of the large sherds on my pot – the blue pencil markings were identified as belonging to him. Unfortunately, they are very difficult to read. 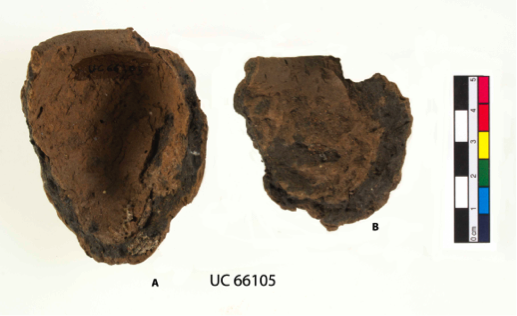 The pot had undergone a previous treatment some time in the past that had now failed, leaving several sherds detached, as you can see in the first photograph above. 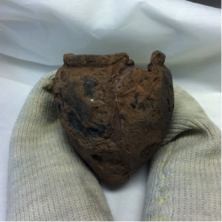 Additionally, the pot had survived not one, but two historic fires! This had left a thick layer of soot on the object, which you can see below. In order to remove it, I had to spend a lot of time testing different cleaning methods and looking at the surface of the ceramic very closely. 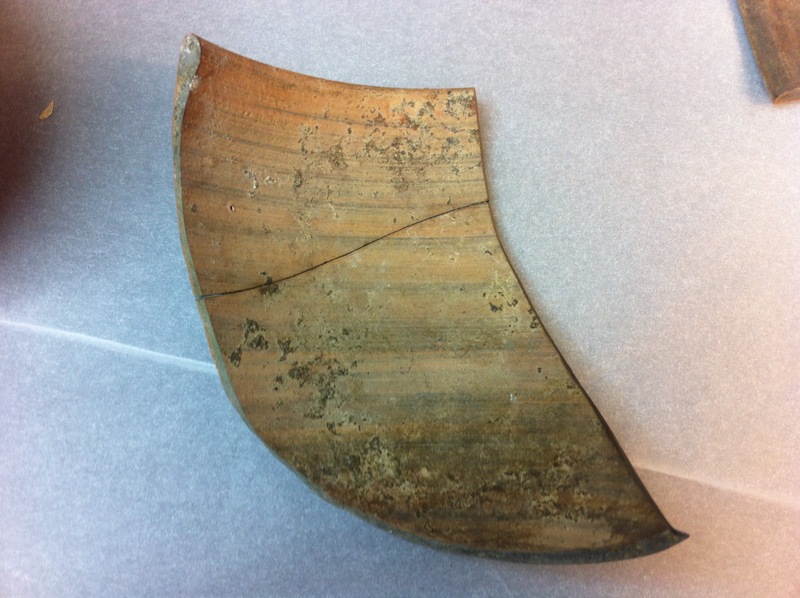 There was an exciting and unexpected consequence of spending a lot of time cleaning the sherds – I saw strange shimmery lines underneath engrained soot on one of the fragments, almost invisible to the naked eye. In order to figure out what I was seeing, I looked at the fragment with an infrared (IR) Dino-Lite, a handheld digital microscope. The infrared rays, with a longer wavelength than visible light, allowed me to not only see more clearly, but take close up images of what was hiding under the soot. 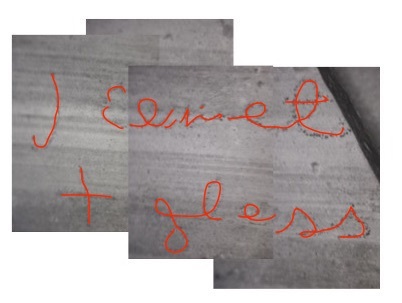 The IR Dino-Lite images of the hidden writing. Whatever is written here is very similar to and in much better condition than the original and much more obvious writing, even under the same conditions! I now need to help to identify what is written. What do you think? 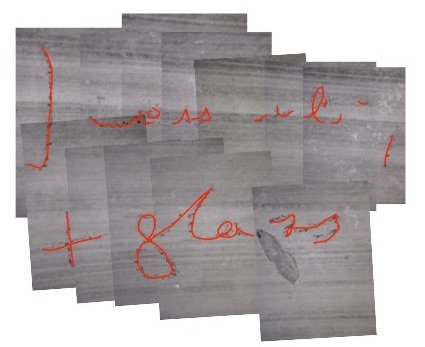 Can you decipher what Petrie has written? 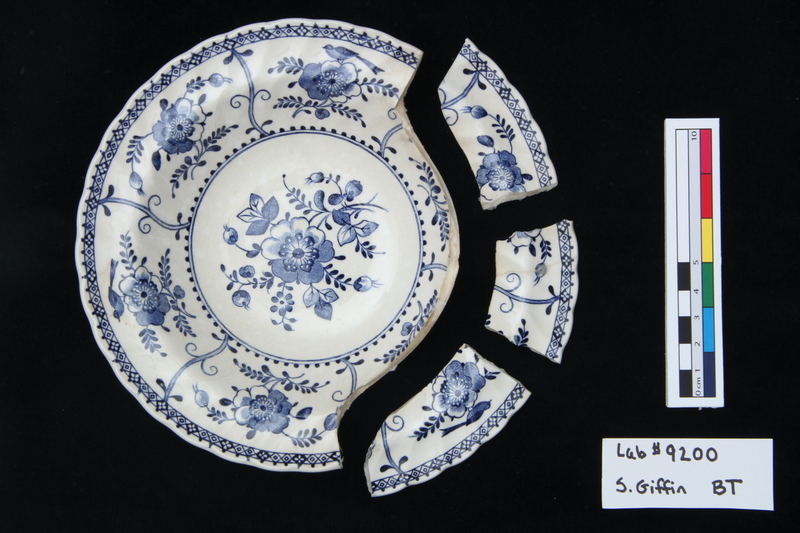 As we saw in Emma’s post from last week, repairing a ceramic often requires the application of a fill to replace gaps or spaces, which can both recreate the object’s original form and provide it with structural support. Inpainting the filled area frequently provides it with camouflage, to avoid bringing unnecessary attention and focus to this recent addition. One aspect of conservation that I find particularly tricky is the lack of a singular, finite answer when it comes to treatment questions. Sometimes, the correct way to proceed for one object is a completely inappropriate method for how you should handle another. An example of this is the difference between inpainting the fill of a decorative ceramic object vs. an archaeological one. 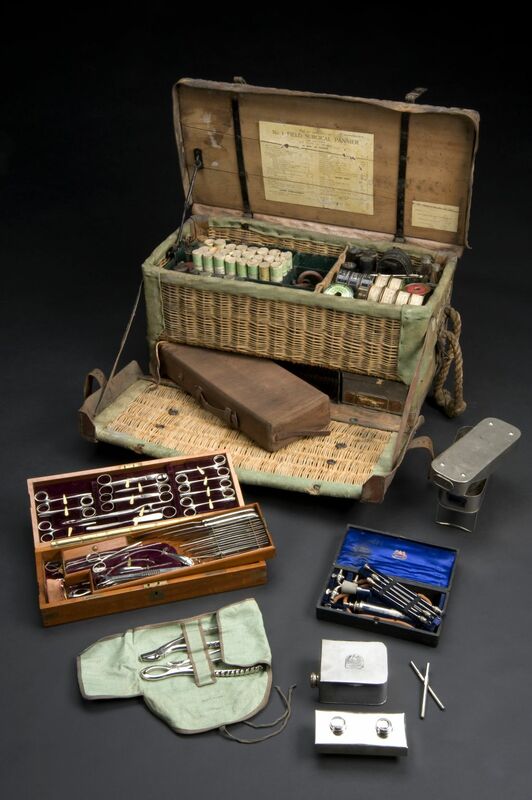 Since there is no set criteria for choosing a treatment based upon object material alone, the important thing to keep in mind is the item’s context and its significance to the stakeholders to which it is connected. This will play a key role in any conservation decisions made in the future. Object no. 9211 before treatment. Courtesy of Liz Pye. According to the owner, the main objective of the conservation treatment was to return it to its original decorative function. Since the goal was to regain the aesthetic of the originally manufactured object, it would be important to colour match the fill as close to the colour of the ceramic body as possible. After reconstructing and filling the bowl, I thought inpainting it would be the easy part. After all, the bowl was white wasn’t it…? Not so much. 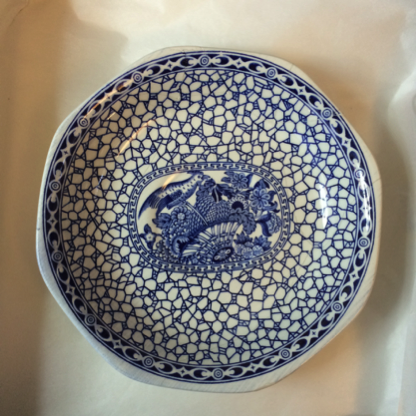 As it turns out, recreating a ‘white’ colour is not as simple as you’d think, and in the case of my ceramic bowl, its ‘white’ body was actually a combination of five pigments. Colour match success! Courtesy of Liz Pye. Object no. 9211 after treatment. Courtesy of Liz Pye. The fills and inpainting can be considered successful because of their close similarity to the object’s existing colour. Because of this, I was feeling confident in my abilities to match and was quite happy that I’d cracked the correct method of dealing with ceramic fills…until I realized that was completely different to the considerations that had to be given to the inpainting of my low fired ceramic, which were two sherds** from a pinch pot dated between 3300 – 2700 BCE, spanning Predynastic and Protodynastic Egypt. Object no. 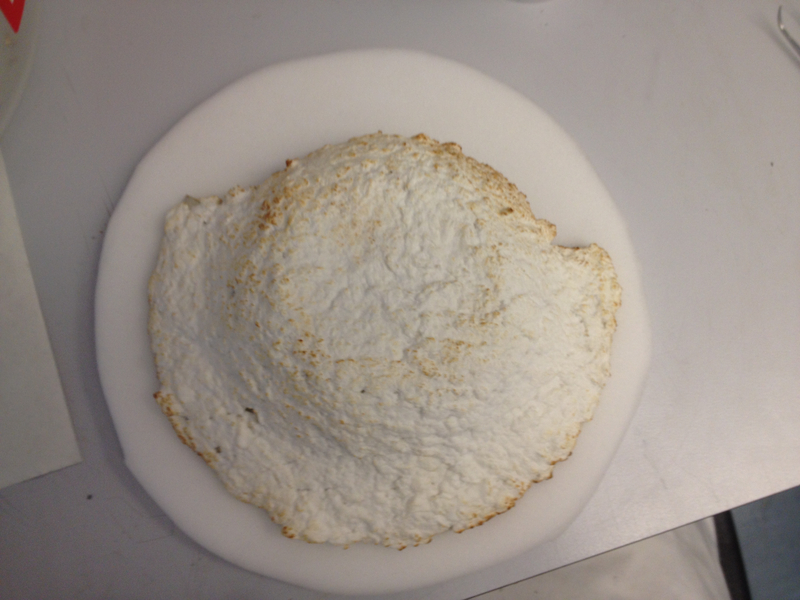 UC 66105 before treatment. Courtesy of UCL, Petrie Museum of Egyptian Archaeology. 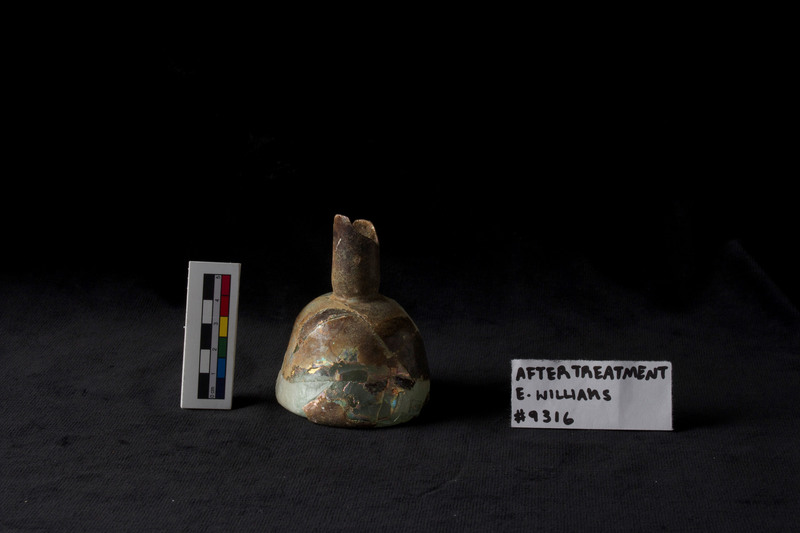 Unlike the high fired ceramic, the objective for this treatment was to stabilize the object for future handling and use in a university research collection. 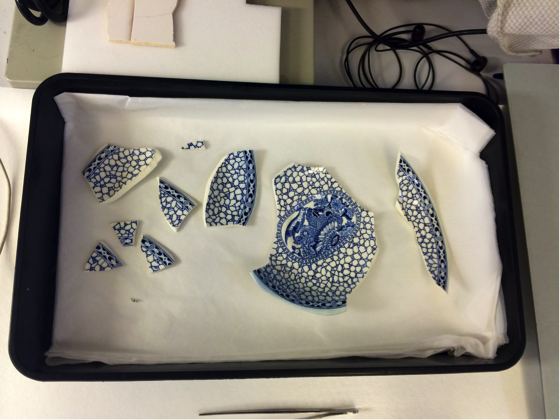 The sherds needed to be reattached, with fills added for structural support. Like the bowl, these fills needed to be inpainted so that the repair wasn’t distracting when viewing the object; however, unlike the bowl, the colour of the fills needed to be distinct from the ceramic body. 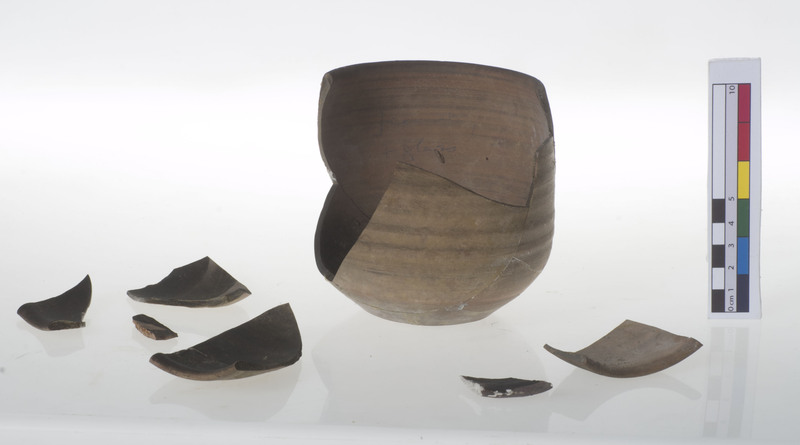 This is because the object will be studied and viewed in the context of its place in an archaeology collection, and so there should be no question as to what is newly added and what is original to the manufacture and use of the object. This presented the challenge of coming up with a colour that would simultaneously look similar yet different to the original. Both of these inpainting jobs were considered successful because they weren’t judged by the same set of criteria. Instead, conservation methods were created from the context clues and significances that were applied to them. For someone who used to study scientific and mathematical concepts that purported to have ‘right’ and ‘wrong’ answers, this was a departure from my comfort zone. That being said, the problem solving that conservation encourages and the creativity that I now enjoy were things that I quickly learned to appreciate. …And as an entirely added bonus, I can now say that I understand colour matching as well as those down at London Fashion Week. *Ceramic – a material composed of inorganic compounds of varying compositions, which can be high fired fired (porcelain) or low fired (terracotta flower pot). **Before anyone thinks this is a typo and that I meant to say ‘shard,’ ‘sherd’ is a term often used to describe archaeological ceramic fragments. So clean. So white. Nothing that would ever make you think “Gee, I think there might be a food stain permeating the entirety of this ceramic” or “Perhaps this bowl is actually a portal into the underworld”. 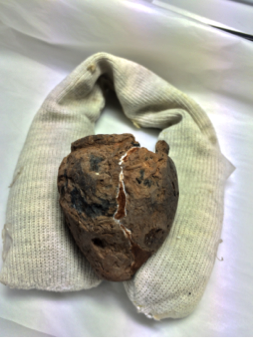 Nothing except a little bit of stain along the fracture surface of the big fragment. 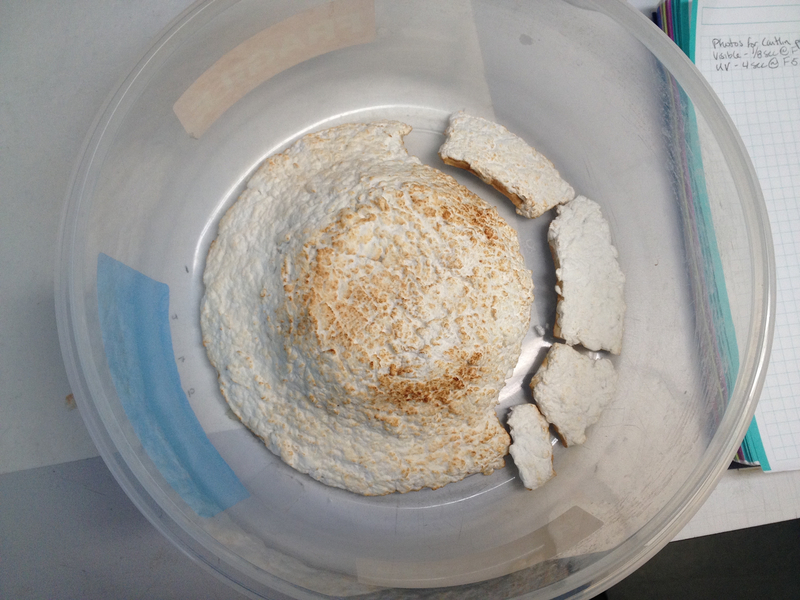 Because I am a student, and because we are encouraged to try out different methods of treatment, I decided that it would be interesting to try to poultice the stain out of the break surface. For those uninitiated in the ways of the paper poultice, poultices are usually used to try to draw a stain out of a semi-porous material through capillary action; as the surface of the poultice dries out with evaporation, the stain is moved out of the wet porous material and into the paper on top. That being said, the first step was to soak the bowl to maximize the efficacy of the poultice. That’s when I got my first glimpse of the demon stain, which the lab named Zuul (from Ghostbusters!). All of that orange is food stain. Food stain seeping from the depths of the bowl. Who knew an otherwise white bowl could contain so much orange? 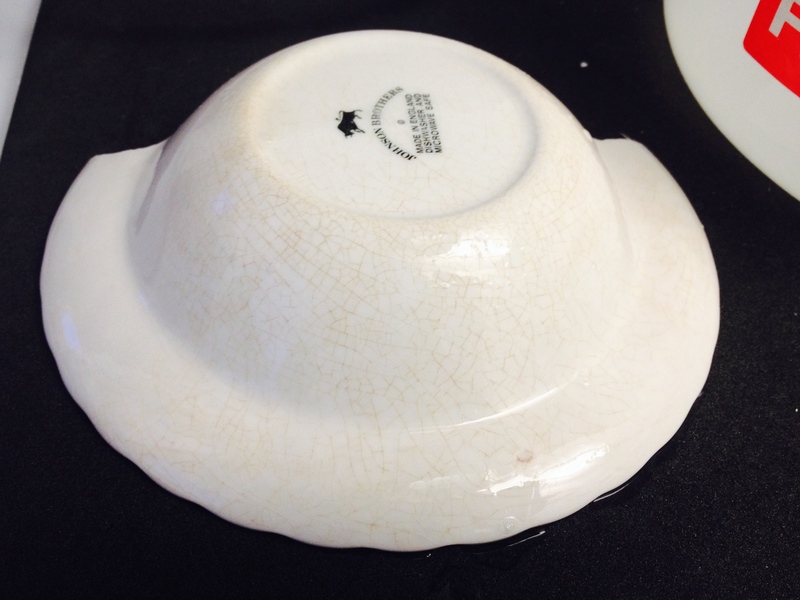 It’s probably tomato soup or gravy that over the years soaked through the cracks in the glaze as the bowl was eaten out of repeatedly. That orange spot is a piece of paper poultice that accidentally fell on the glaze surface. Zuul has turned the paper bright orange as it comes out of the glaze. After this miraculous discovery I decided to change my strategy to full surface poulticing. And I poultice some more for two and a half months until I could poultice no longer, and still Zuul continued to ooze from the depths. Sometimes we wondered whether or not this was still stain or portal to the spirit world. Unfortunately, although much of the food staining (Zuul) was removed from the bowl, stain still remains particularly in the glaze cracks. 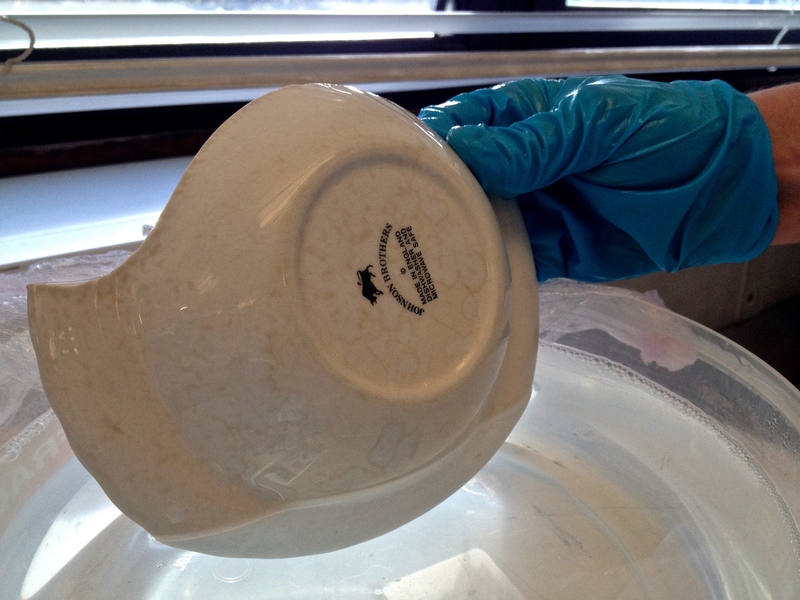 This means that the future treatment of this bowl will involve controlled bleaching to try to eliminate the orange colour. 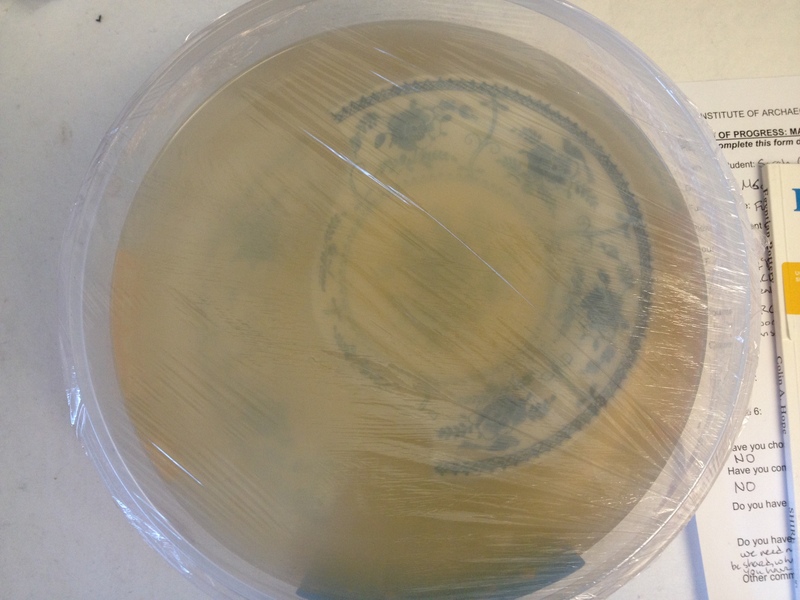 However, bleaching will not physically remove the stain like poulticing did. It will only eliminate the orange colour from the surface of the stain. Although the soaking and poulticing treatment ended up causing residual staining in the glaze, it proved to be an excellent learning experience for me. Not only was I able to see how readily stains can mobilize when soaked in water, but I also became a poultice-making pro, and can now expertly apply an effective poultice in a variety of methods. 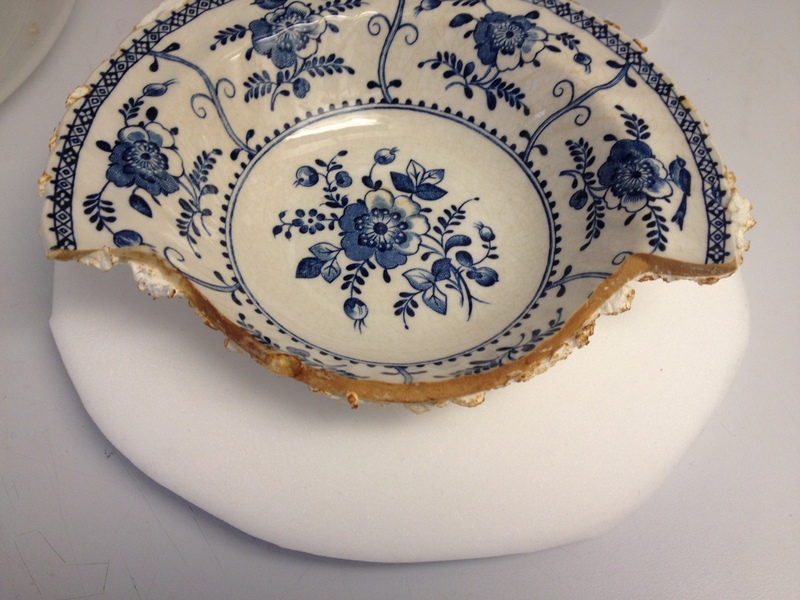 But let this serve as a warning: don’t eat out of dishes with glaze cracks. If you do, Zuul might make an appearance again.